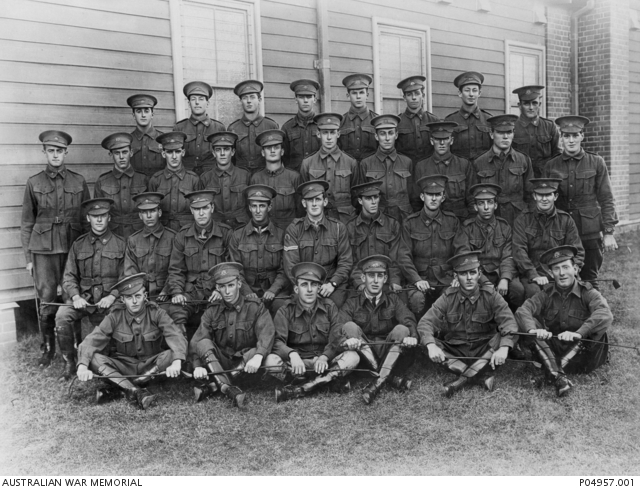 Group portrait of AASC (Australian Army Service Corps) Regimental Transport to the 36th Battalion. Identified from left to right, back row: 939 Driver Jack Drury; 941 Driver William Christopher Collins; 1394 Driver William McCauley; 1389 Driver Percy Jack Goldrick; 393 Driver Joseph Anthony Bondietti; Driver S. Powell; 1908 Driver Jack Skehan; 779 Driver George Matthew Hourigan (later of the 33rd Battalion, who was killed in action on 10 May 1918 in France). Third row: 12459 Driver Henry Benallick Fernon; 1382 Driver Rupert William Richardson; 1384 Driver Cecil Wolfred Beattie; 1393 Ernest Cyril Knight; 1388 Driver Reginald Gazzard; Brothers, 1386 Corporal Ferdinand William Cunningham; and 1387 Leopold Justin Cunningham; 1395 Driver Claude William Cleo Stone; 1145 Driver John Collins; 1144 Driver Edgar Richardson. Second row: 154 Driver Alfred William Potiphar (later killed in action on 22 July 1917 at Messines ridge); 2689 Driver Kenneth Walte Roberts; 1948 Driver Edgar Charles Goodwin; 12452 Driver George Austin Morschel, (later died of sickness on 25 January 1917); 940 Driver Albert Edward Holmes; 415 Driver Frank Moore Crummer; 1385 Driver Harry Edward Warren Bishop; 12309 Driver James Edward Frederick Pym; 1392 Driver Albert William Kennedy. Front Row: 490 Driver Thomas Picton Kershaw; 1391 Driver William Grant; 12298 Driver Ephram Thomas Daniels; 12302 Driver Francis Harry Erskine; 1220 Driver Harold Silas Richards; 1437 Driver Francis Vincent McKewen.